Generally speaking, recipes that are in advertisements or on the back of bags are tasty. Usually they're reliable because the company wants the recipe to be tasty so that you make it again, and therefore also buy the product again. And for a product like Bisquick, these recipes are wonderful and a definite way to create brand loyalty. What can you replace with it? (Okay, there might be things, but I don't use Bisquick, so I'm not sure what a replacement would be.) The recipes found on bags of flour, baking soda, or even in ads for tahini aren't nearly as likely to create the brand thing. However, some people buy the same brand over and over, or it may the only brand at your store, so it works. Like the peanut butter cookies on the baking soda (I just bought a new canister: same brand, but that has nothing to do with the recipe, it's the only aluminum-free one at the grocery store). And the Brain Power Pita Pockets in the ad for ... after seeing it for years (it has to be in every VT issue) I finally made it because it my cousin pointed it out. Somehow I'd always ignored it. Though of course, I didn't use Joyva - I used the brand of tahini that I had in the cupboard - the one that was the best value the last time I bought tahini. I'm not sure where the long digression came from. But the point: I liked the sandwiches, as did my cousin. I'm sure they wouldn't appeal to everyone, and I do think they could possible benefit from some crunch, but they did lead me to buy something I never had before: alfalfa sprouts. This would probably, based on the whole "brain power" claim be a better lunch than dinner, and I think once school's back in session, this may be my lunch some days. I used firm tofu because I couldn't find soft. In a small bowl, whisk together yogurt, tahini, garlic, and lemon juice. Set aside. 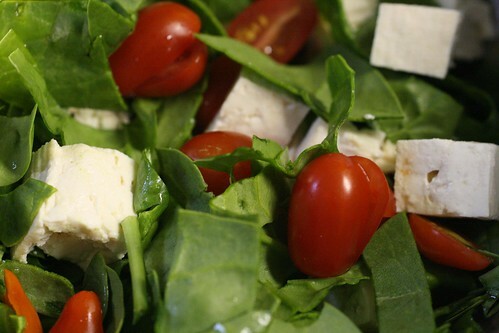 In a medium bowl, toss together the tofu, tomatoes, and spinach. Add 2 spoonfuls of dressing and mix. Cut off and edge of each pita. 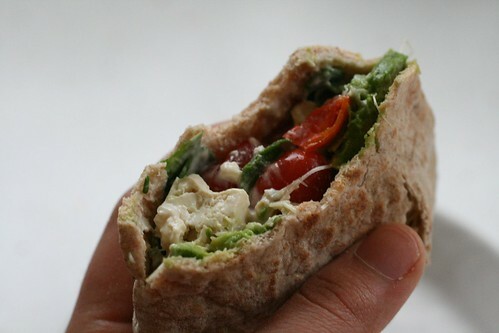 Divide sprouts and avocado evenly between pitas; divide tofu mixture and stuff into the sandwiches. Drizzle or serve with remaining sauce.